This innovative book explores ten great works, by well-known thinkers and orators, whose impact has been intellectual, practical and global. Most of the works significantly precede public relations as a phrase or profession, but all are in no doubt about the force of planned public communication, and the power that lies with those managing the process. The works are stimulating and diverse and were written to address some of society’s biggest challenges. Although not traditionally the focus of public relations research, they have all had a global impact as communicators and as the foundation for fundamental ideas, from spirituality to war and economics to social justice. Each addresses the implications of structured communication between organizations and societies, and scrutinizes or advocates activities that are now central to PR and its morality. They could not ignore PR, and PR cannot ignore them. This book will be essential reading for researchers and scholars in public relations and communication and will also be of inter-disciplinary interest to study in sociology, literature, philosophy, politics and history. Chapter 1. 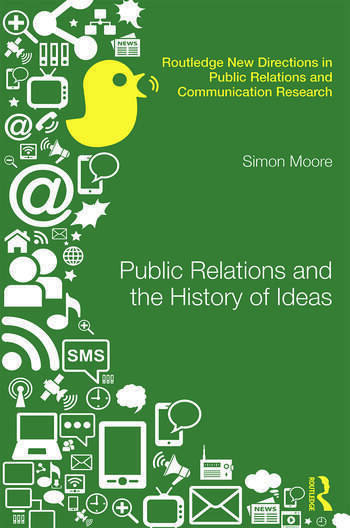 Public Relations in the History of Ideas Chapter 2. Virtuous PR - Confucius, Analects Chapter 3. Noble Falsehoods and PR - Plato, The Republic Chapter 4. The Problem of Perfection - Al-Farabi, On the Perfect State Chapter 5. PR and the Subjugation of Reason - Luther, The Ninety-five theses Chapter 6. Willpower and the Expansion of PR - Clausewitz, On War Chapter 7. PR, Scientific Inquiry and Utopian Mysticism - Marx & Engels, Communist Manifesto Chapter 8. Proofing Against Puffing - Mill, On Liberty Chapter 9. Modern Campaign Management? - Gandhi, An Autobiography, or the Story of My Experiments with Truth Chapter 10. Accepting and Fearing PR - Hayek, The Road to Serfdom Chapter 11. PR’s Choice: Creating Audiences or Discovering Individuals - Jung, The Undiscovered Self Chapter 12. PR’s Future: Irrational or Rational? Magical or scientific? Individual or collective? Simon Moore is Associate Professor and Chair in Information Design and Corporate Communication at Bentley University, USA.